A black "RG" patch adorned umpire sleeves in memory of former AL Umpire Russell Goetz, who passed away in his hometown of McKeesport, Pennsylvania on March 15, 2017, at the age of 86. Former AL Umpire Russ Goetz has died. He was 86. Russell "Russ" Louis Goetz broke into the American League in 1968 after a lengthy minor league career that took the 6'2" US Navy veteran from the Georgia State League, to the Carolina and South Atlanta Leagues before his final stop in the Pacific Coast League, where he officiated from 1962 until his promotion to the American League in 1968. He officiated 2,384 regular season games at the Major League level, featuring two All-Star Game appearances (1970 & '75), four AL Championship Series (1970, 74, 77, 81), and two World Series (1973, 79). Goetz's 54 career ejections from Eddie Stanky on April 28, 1968 through Ron Hassey on July 15, 1983, placed him in the "not too often" range amongst umpires with one ejection per 44 games officiated. For comparison's sake, Hall of Fame Cal Hubbard also ejected once per 44 games worked, with Tom Connolly (1 per 38) and Jocko Conlan (1 per 32) close behind. Comparable modern umpires include Ted Barrett (1 per 47) and Mark Carlson (1 per 41). Goetz, a staunch supporter and user of the outside chest protector, wore AL sleeve number 5, which eventually fell into the care of Dale Scott. 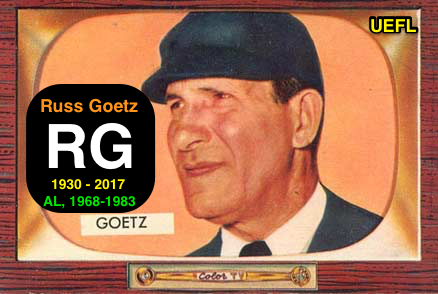 Goetz is a member of the Pennsylvania Sports Hall of Fame.